Our team has worked closely with Grill’d, a popular Australian burger chain, over the past few years to refresh and optimise the business’s digital presence. Following a successful website redevelopment, the team engaged us to oversee the UI and UX of a new mobile app. Our project involvement spanned UX workshops, detailed user journeys, wires, prototypes, and a full UI design for both iOS and Android. 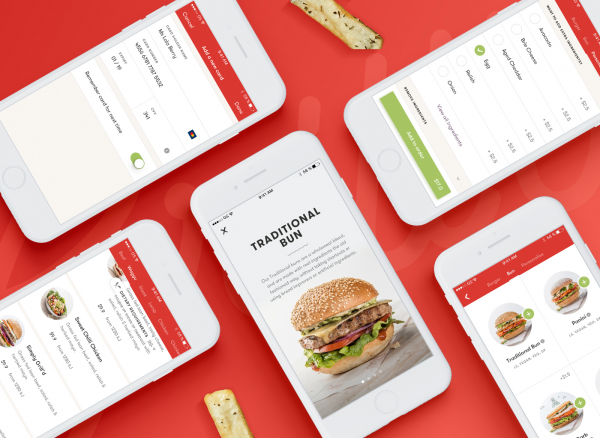 When designing the app, we strived for a level of consistency between it and the Grill’d website. However, we stayed mindful to design specifically for small screen size and to account for mobile users’ needs. The end result is a crisp, functional app that allows users to quickly and easily browse menus, locate stores, and access location-specific offers, news, pricing, and more. The design aesthetic, while slightly modified, still emulates the same irreverent, illustrative style Grill’d is now known for. 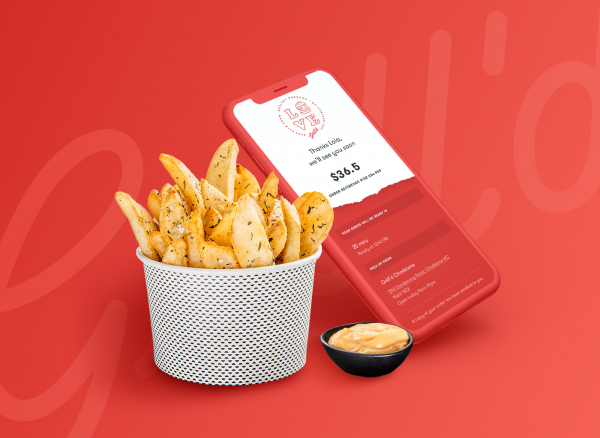 Grill’d wanted to translate many of the experiences available on its website (such as online ordering and an interactive menu) over to the app, but have them designed in a way that felt more native to a mobile device. 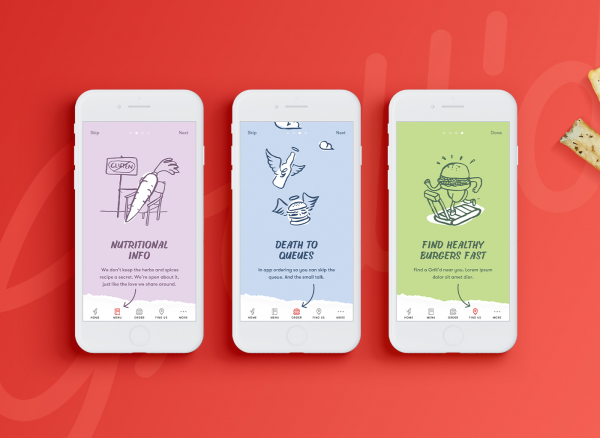 The team at Grill’d came to us for recommendations on how to create a fast, easy, and engaging navigation for app users. 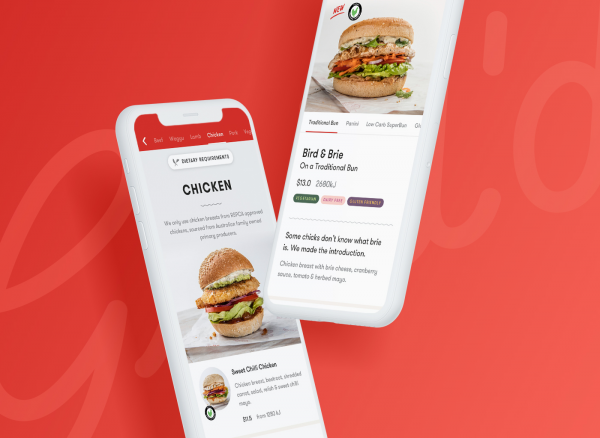 Over time, Grill’d intends to introduce additional features and refinements, some of which are in production and others that are in the ideation stage. Without access to the intended full range of features, we worked proactively to design an environment that would easily accommodate new or expanded additions to the app experience. Finally, Grill’d has plans to integrate promotions and other reward incentives (e.g., BOGO offers) within the app, making it imperative that the app be structured in a way that users can receive and redeem offers across the brand and specific to their local or favourite Grill’d franchise from their smartphones. 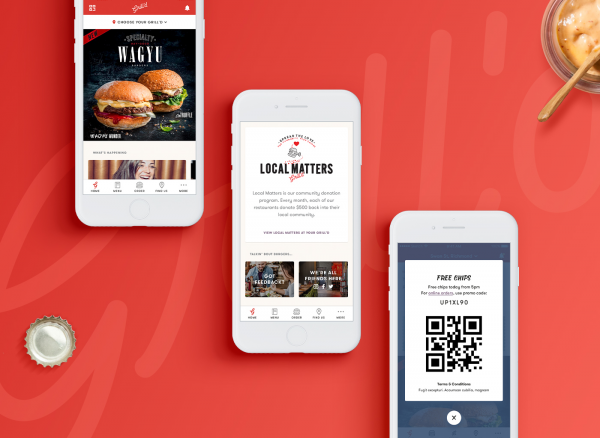 After positive feedback from customers and staff alike on the new Grill’d website, the team engaged us to assist with the app because they knew it needed to carry over the same look, feel, and functionality as the other properties in its digital ecosystem. Further, because the app is a central fixture for future marketing efforts including digital offers and location-specific promotions, creating a seamless user experience was all the more information. We executed on the brief by taking a considered approach to the app’s design and flow. 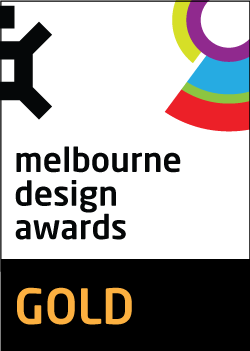 A smart, intuitive navigation leads users through the app, supported by bold typefaces and high-res, colourful photography. Bearing these use cases in find, we anchored a toolbar to the bottom of the screen to allow users to navigate between the most common/accessed sections of the app. 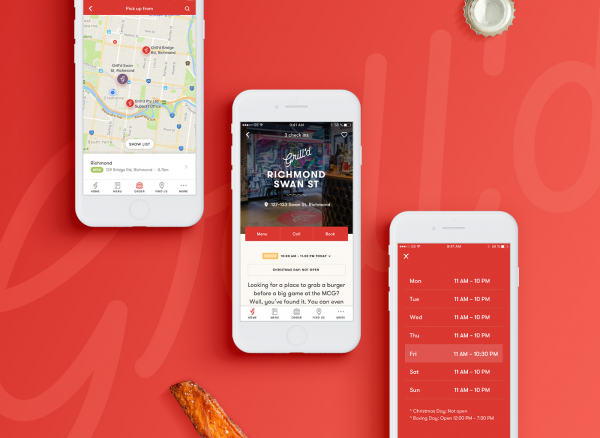 Favouriting a Grill’d restaurant prompts a number of in-app changes. For example, pricing adjusts to reflect the chosen location; the home screen news feed recalibrates to feature local news alongside national news; and the order process is expedited through auto-populated data. Prominently featuring deals and vouchers on the homepage and storing them in users’ app inbox. Standard privacy procedure was followed in accordance with best practice on all contact forms and other areas of the website/app where personally identifiable data was collected. In addition we ensure that no personal information is passed through Google Analytics (eg. email addresses). Regular penetration testing is conducted to ensure the site and server are secure. The website, hosting and infrastructure pass this testing with no significant issues identified.